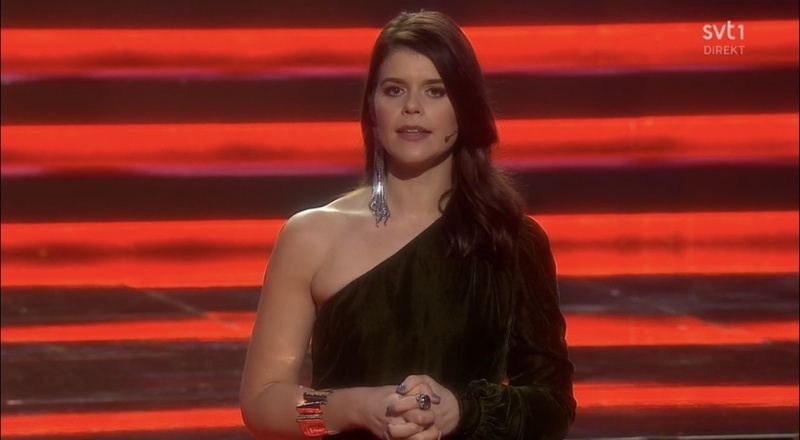 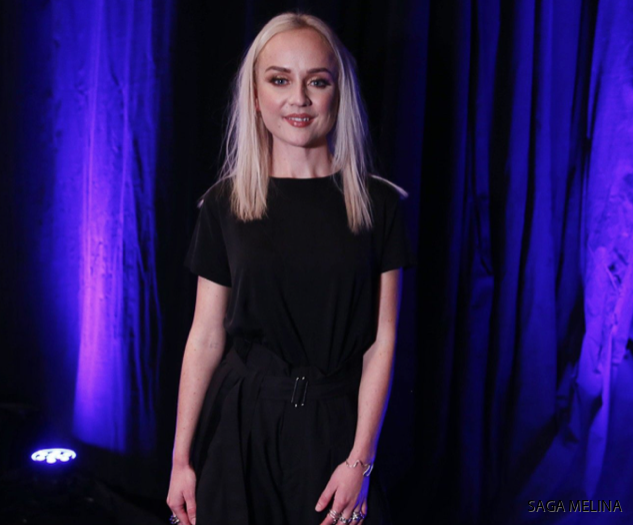 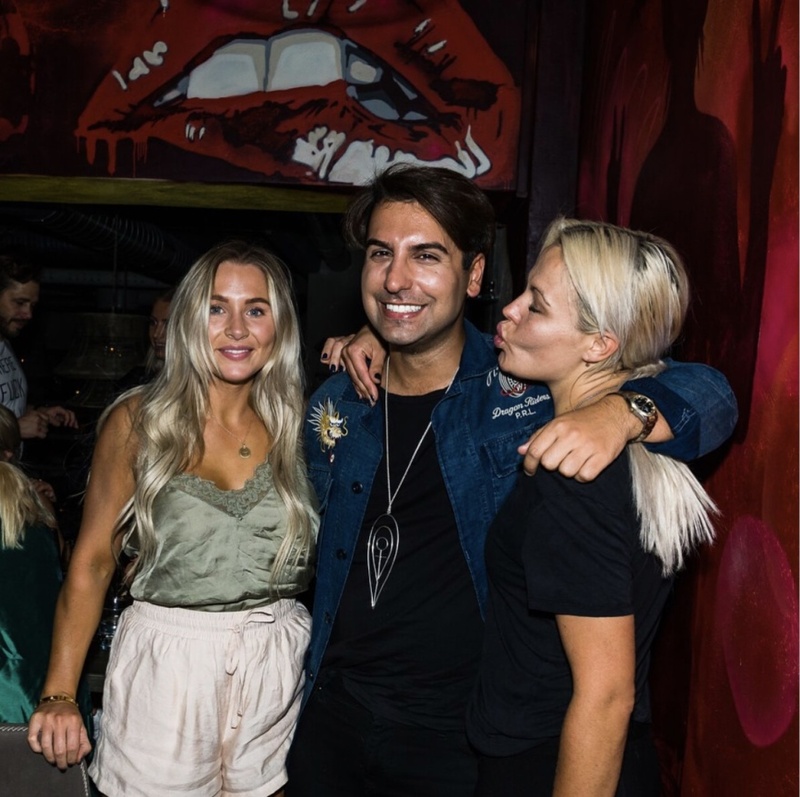 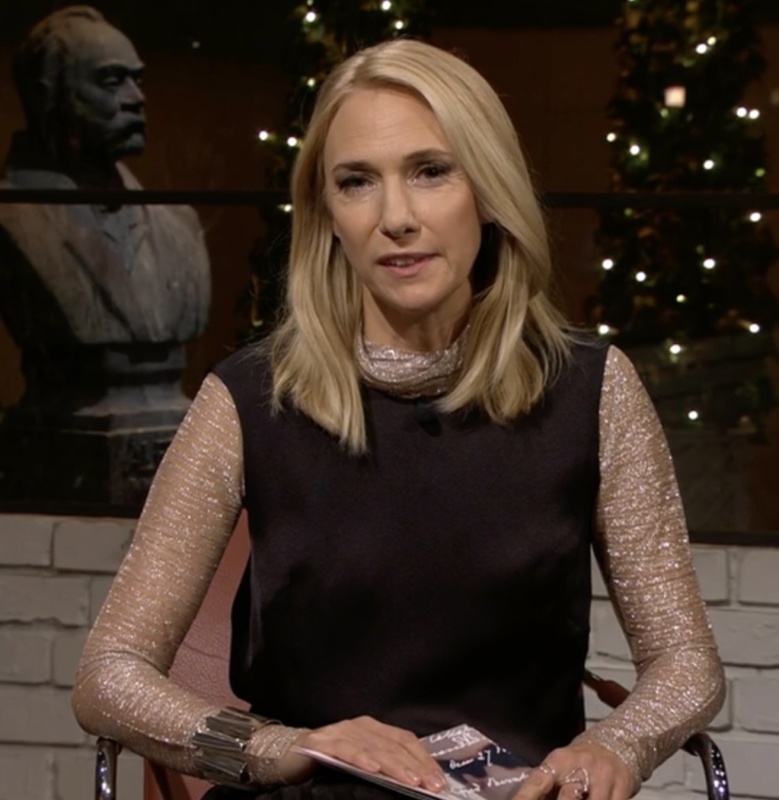 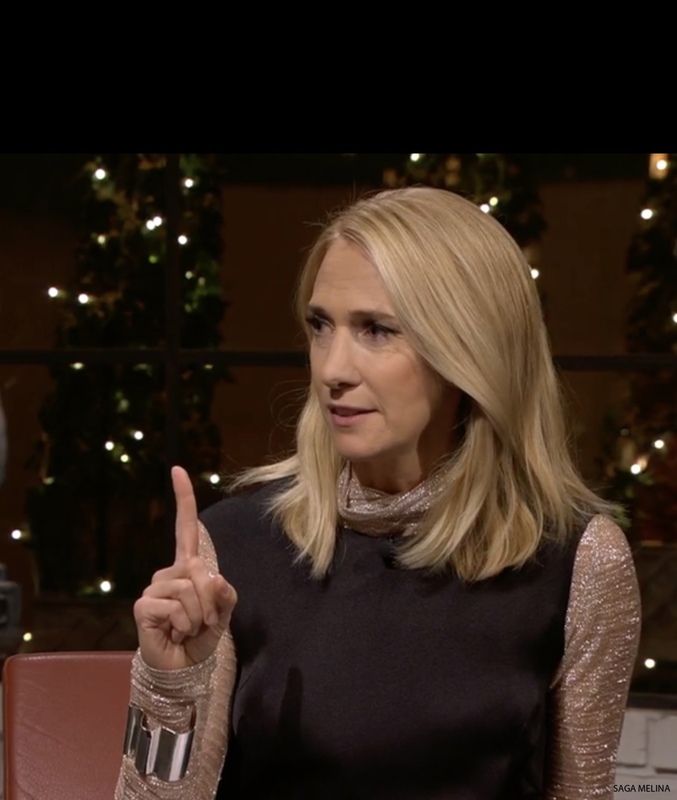 The hostess of Guldbaggegalan 2019, Emma Mohlin in Knowledge - bracelet. 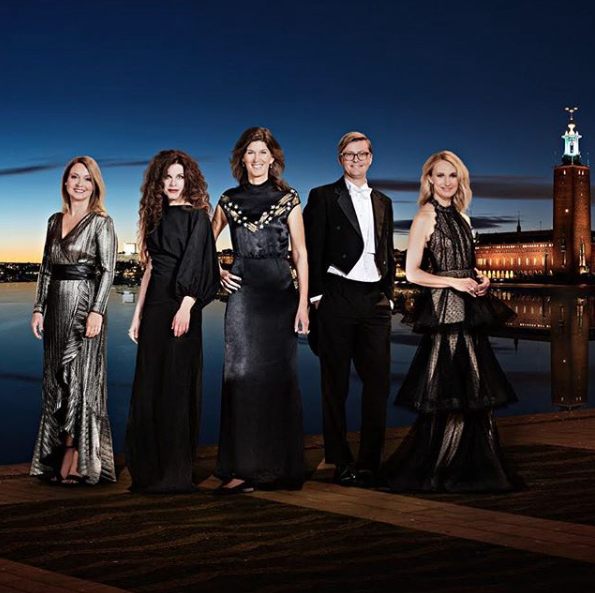 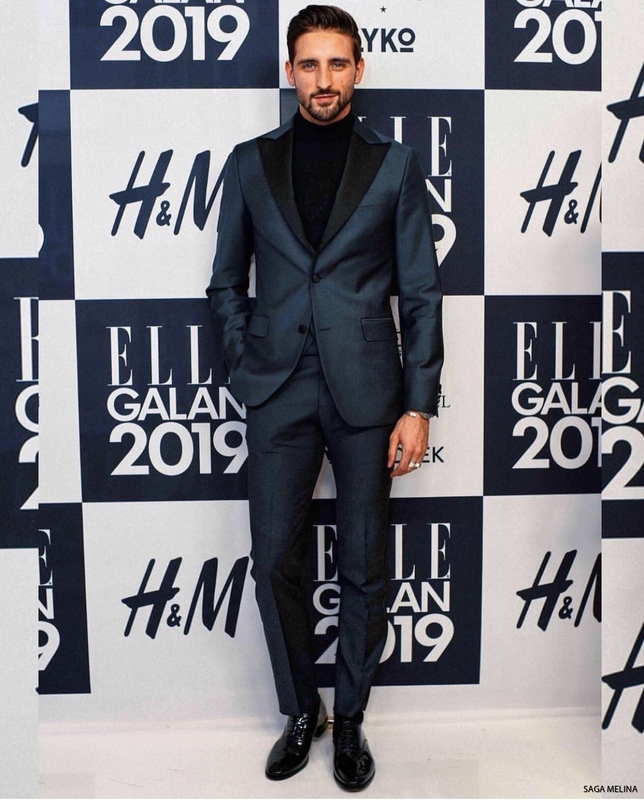 ELLE - gala 2019. 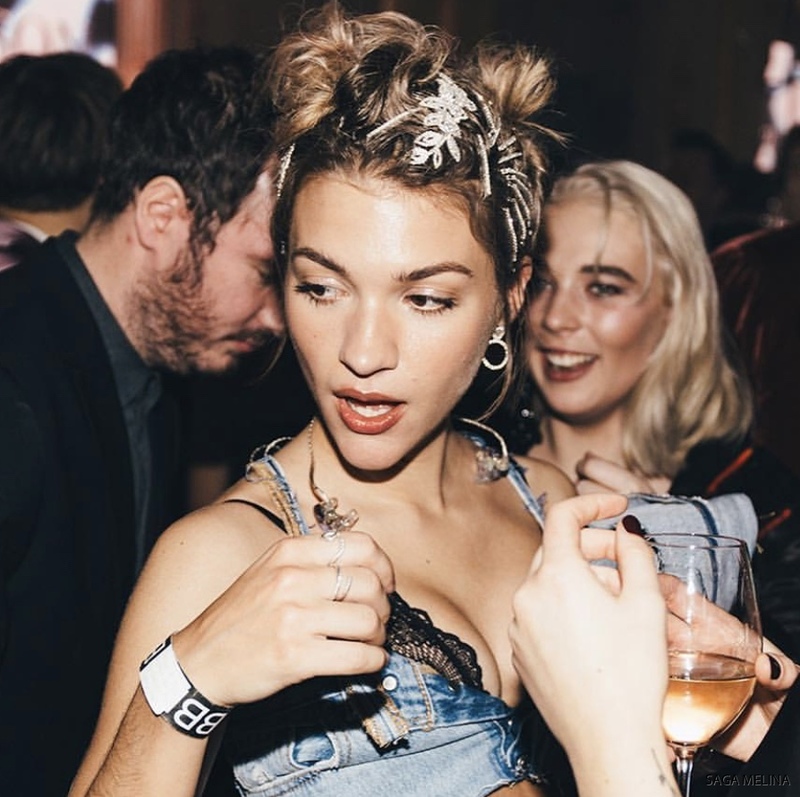 Tove Styrke in the rings Lemme hug ya, Snakish, Sabina och Little Snake. 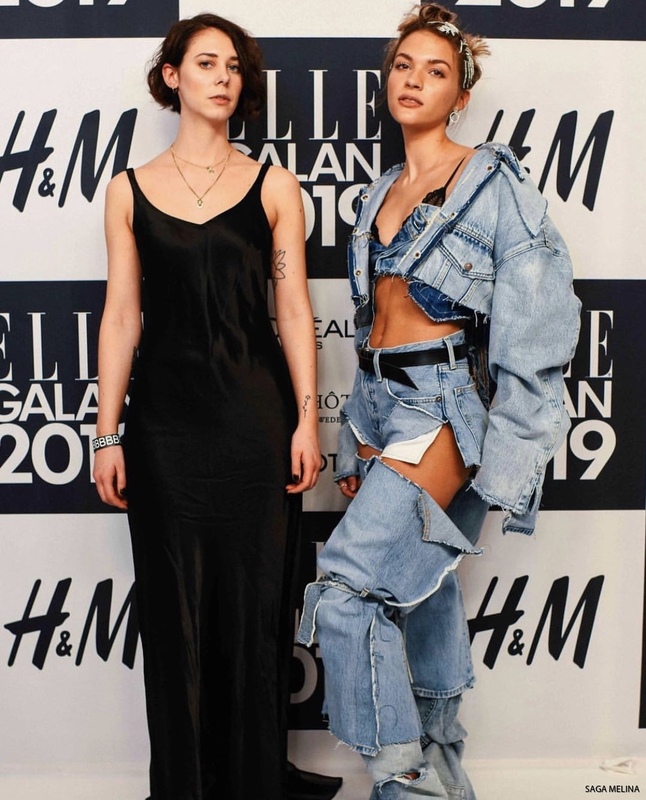 ELLE - gala 2019. 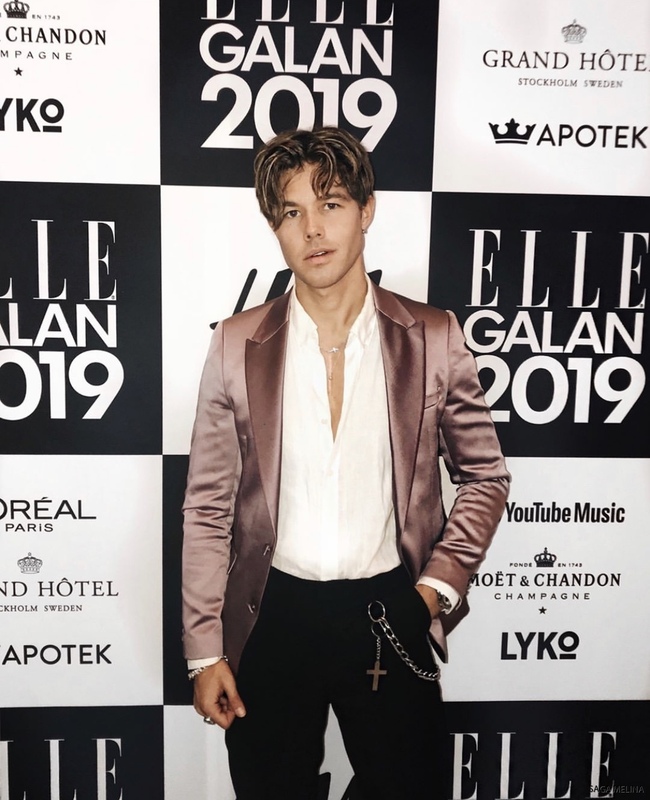 Andreas Wijk in Reef ring. 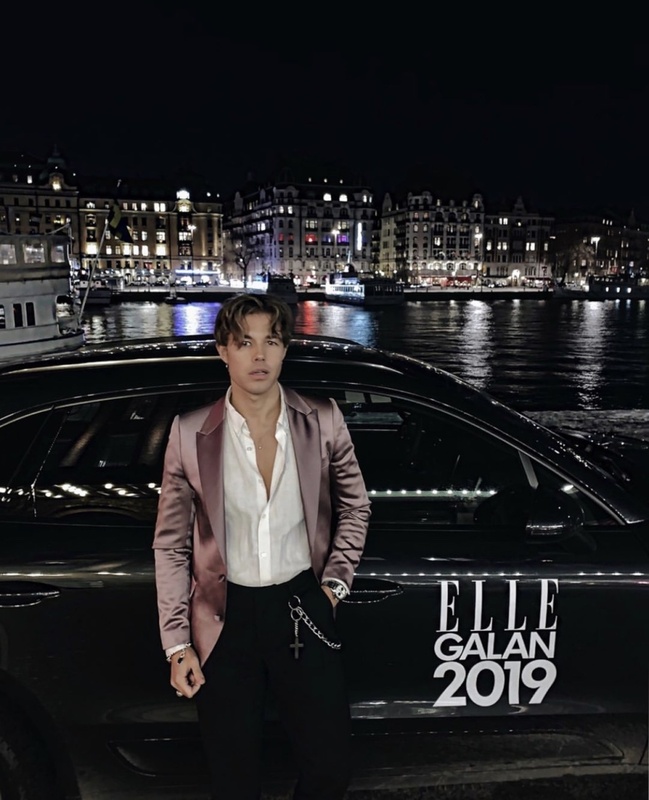 ELLE - gala 2019. 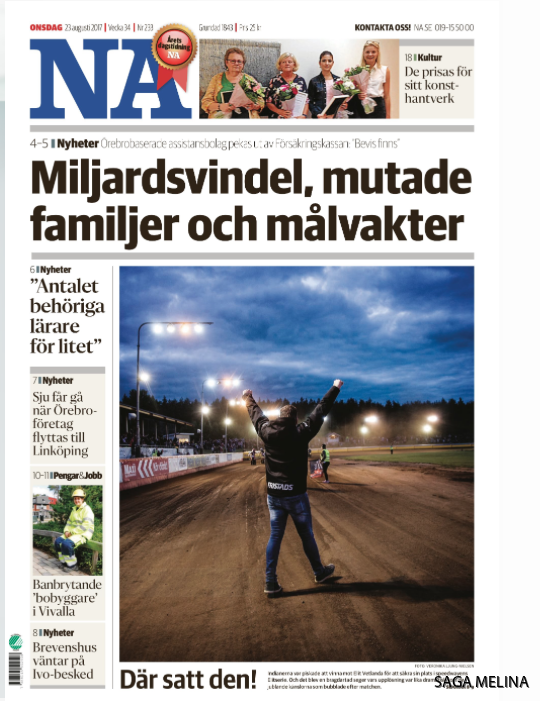 David Lundin in our ring. 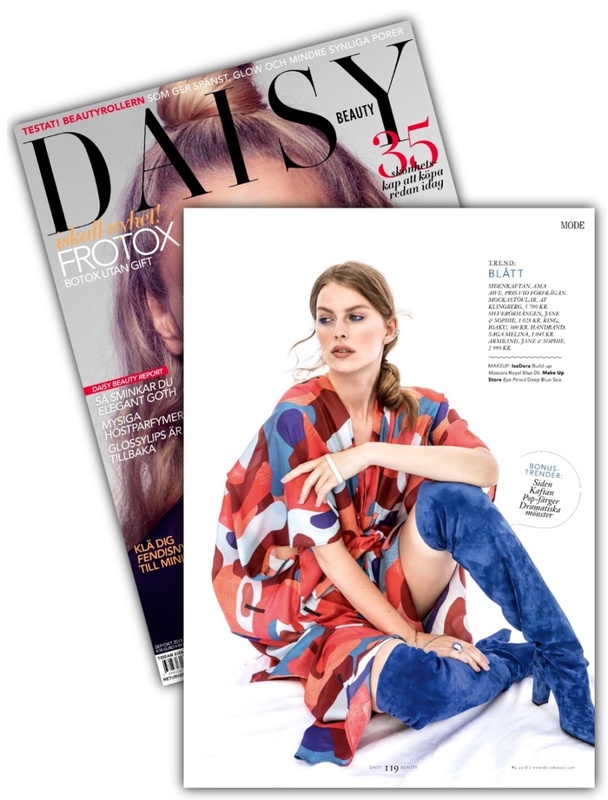 Daisy Beauty, January / February 2019. 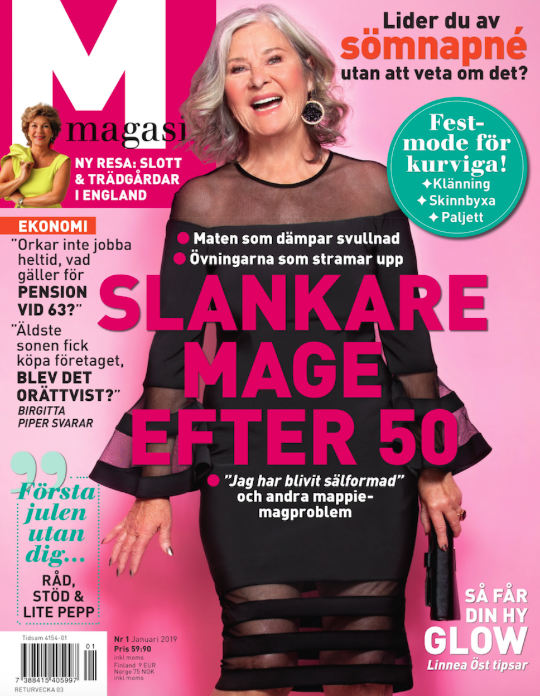 M Magasin, Nr 1 2019. 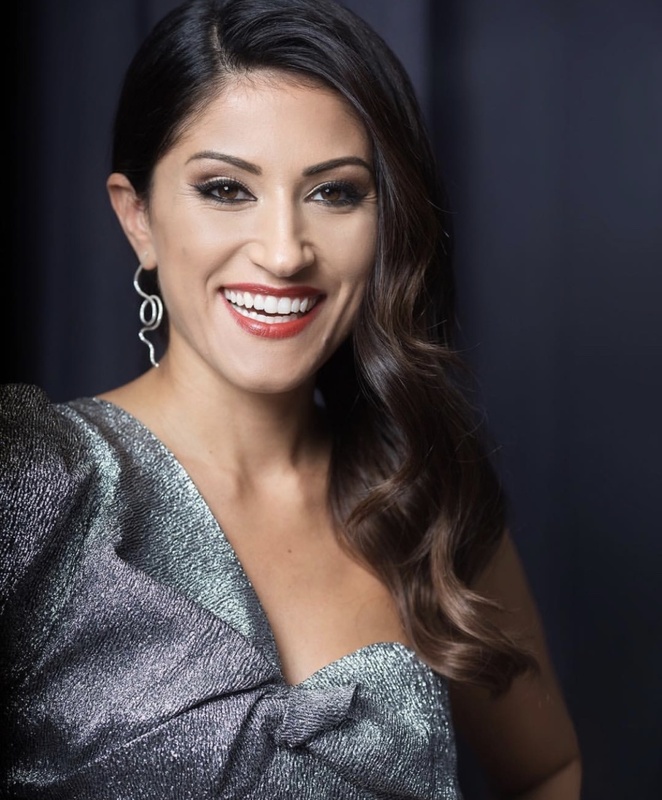 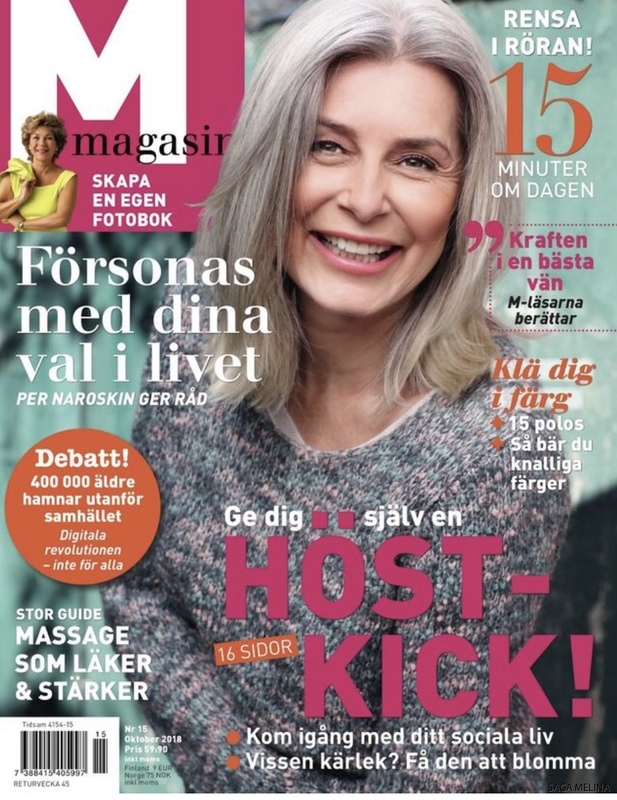 Hostess Jessika Gedin, Nobel 2018. 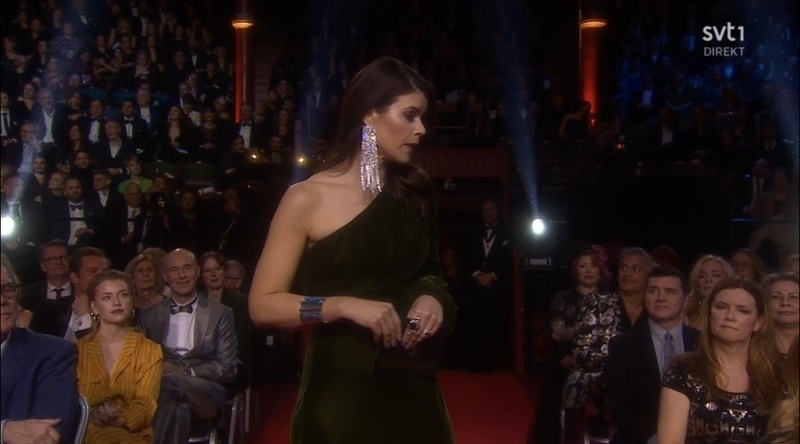 Nobel 2018, hostess Victoria Dyring in Knowledge - bracelet, Lemme hug ya - ring and Sabina - ring. I Climber - bracelet, Lemme hug ya - ring, Baby snake - ring and Snakish - ring. 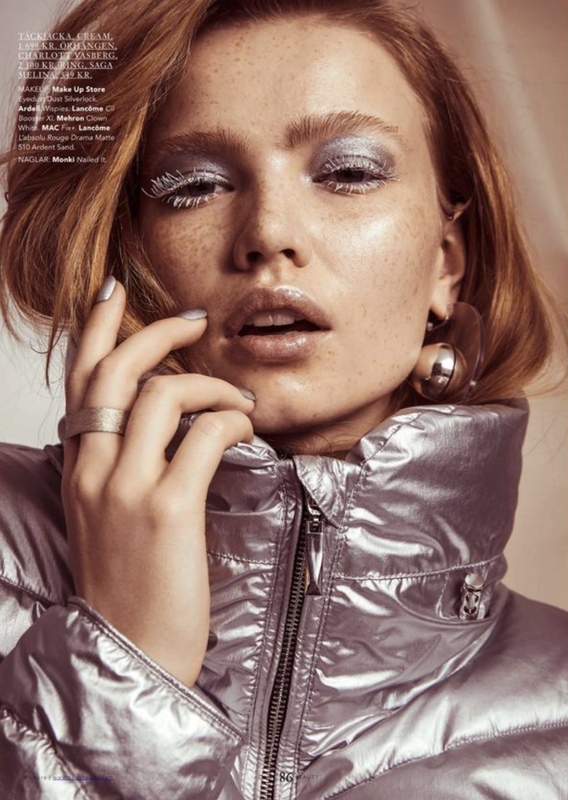 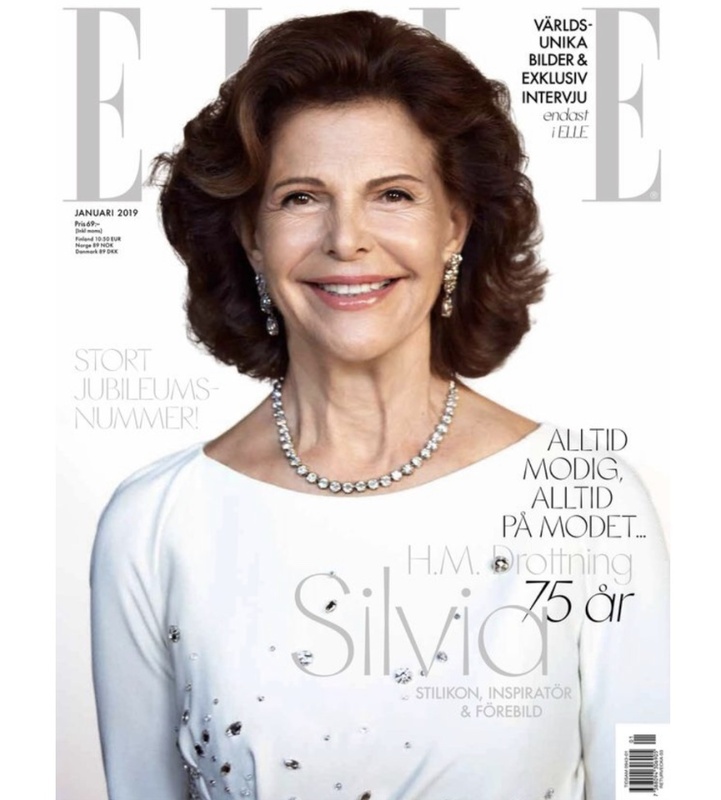 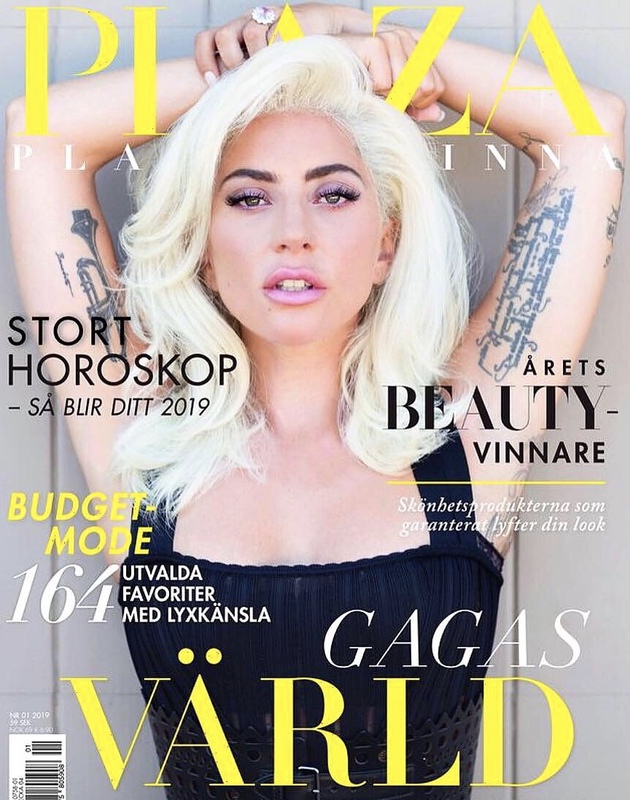 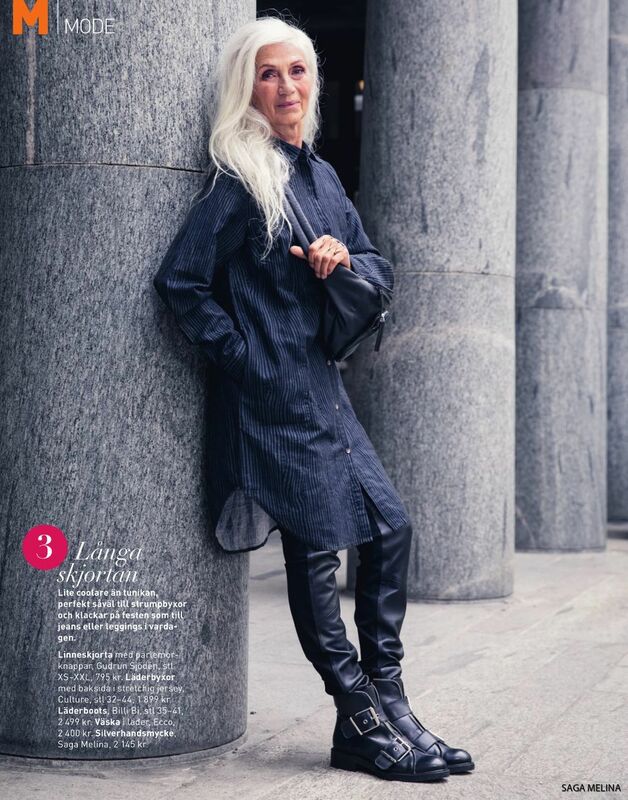 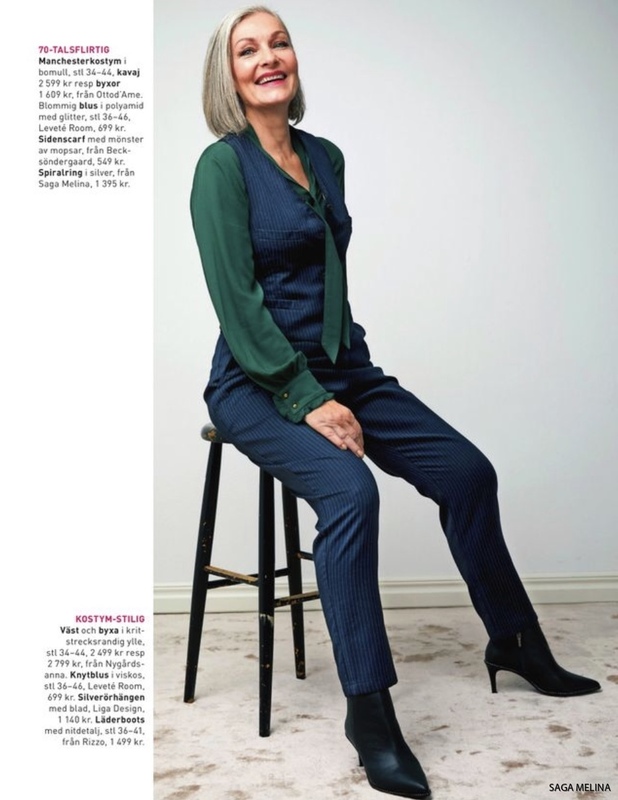 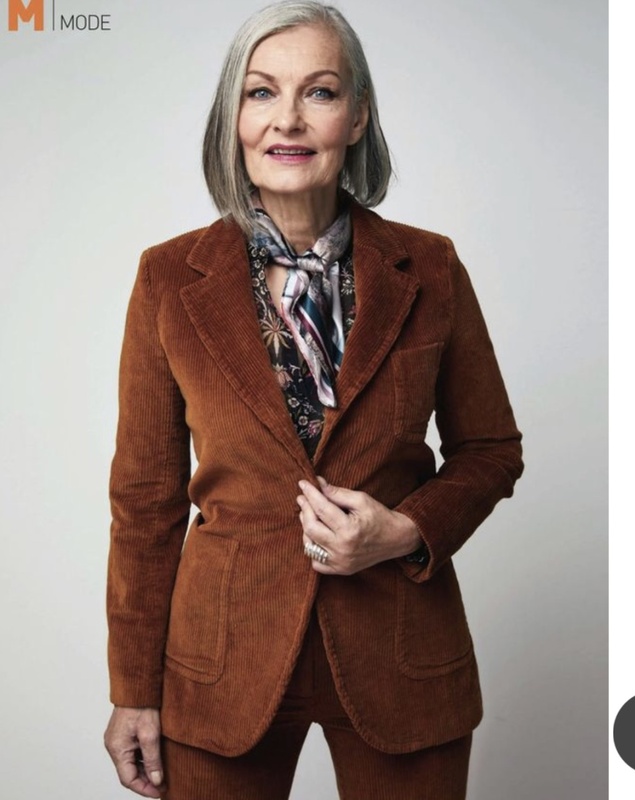 Jill Johnson in the magazine Damernas Värld, number 14, 2018. 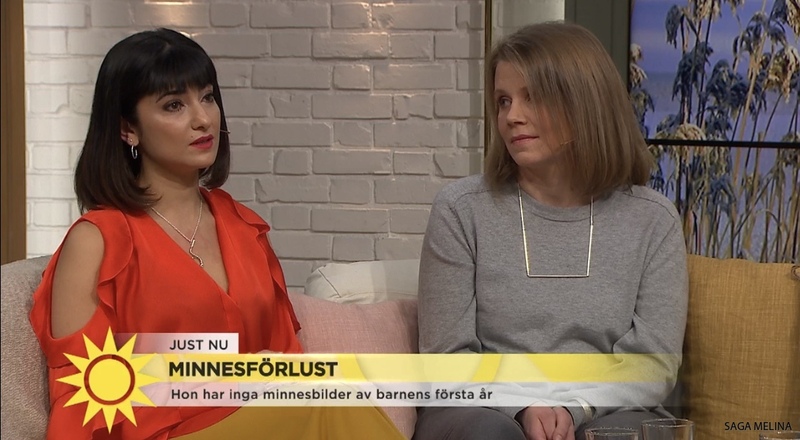 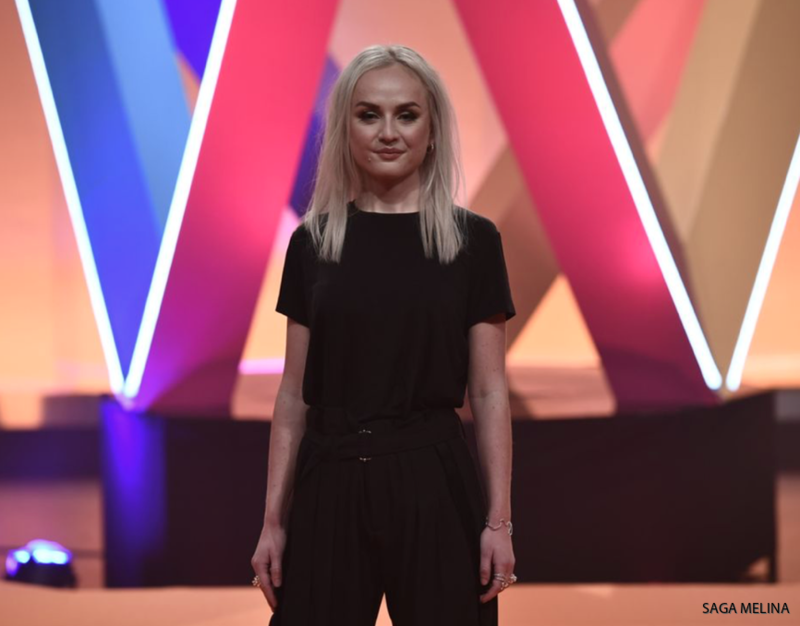 Nikki Amini in Boss-earrings on TV4 IDOL, november 2018. 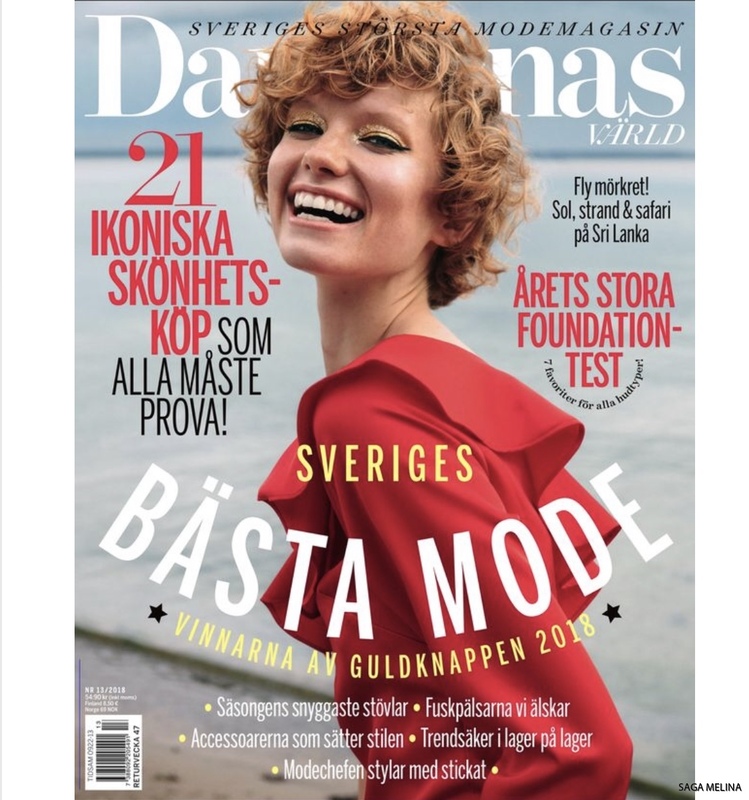 Damernas Värld nr 13 2018. M Magasin nr 15, 2018. 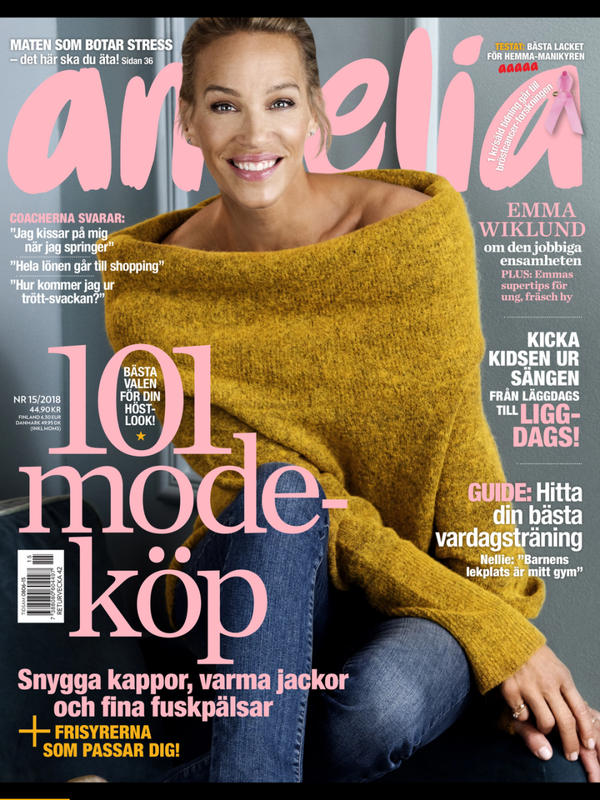 Amelia Magazine, Nr 15 2018. 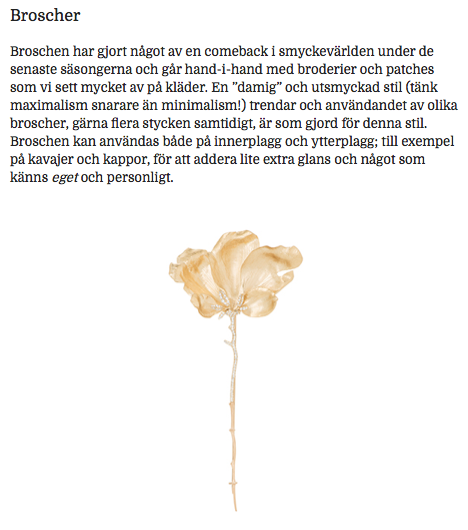 Daisy September nr 5 2018. 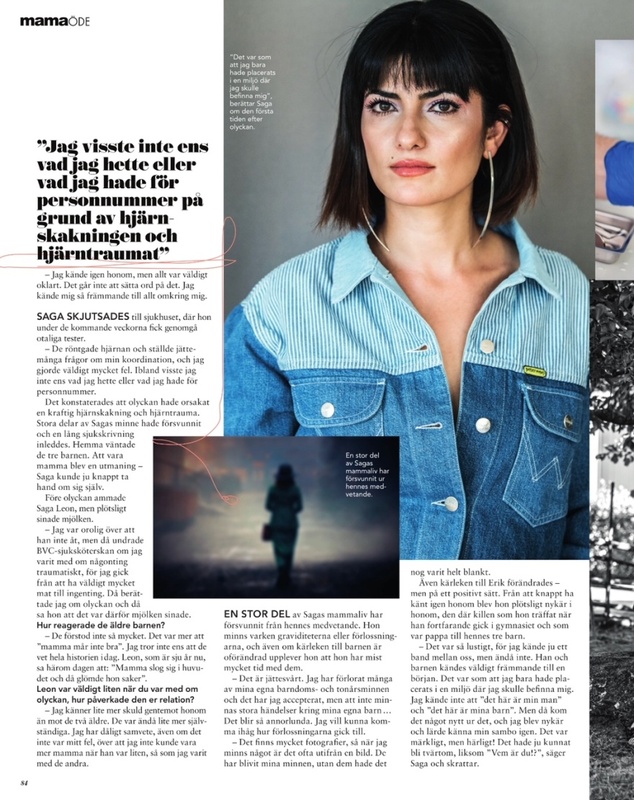 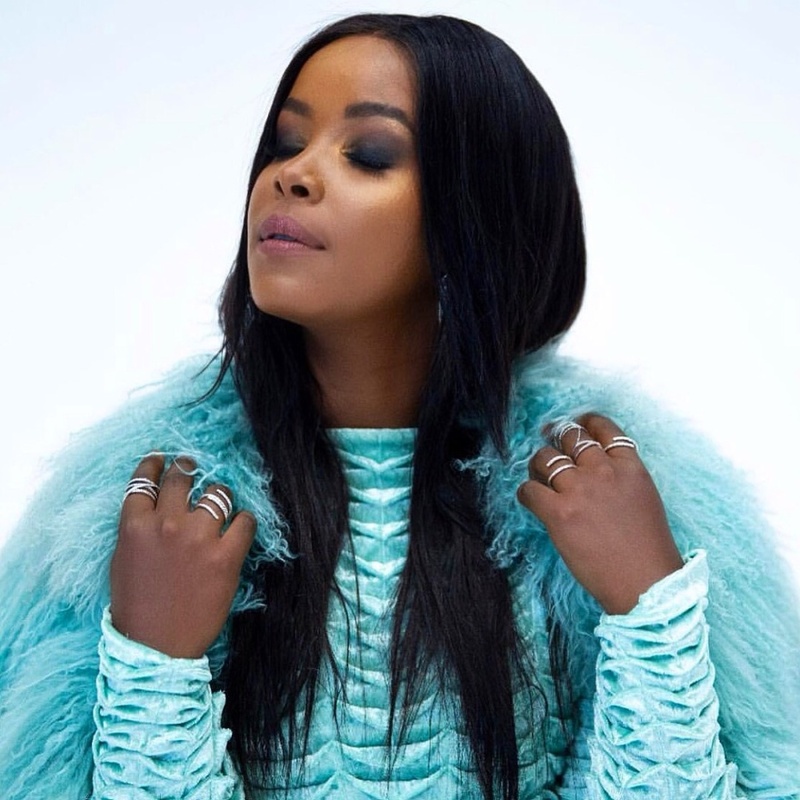 In the magazine MAMA, September 2018. 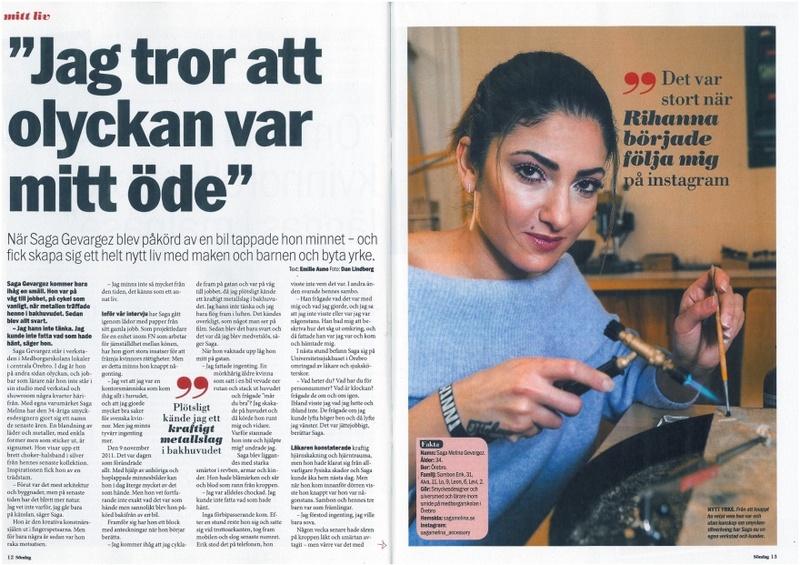 Read the whole article online, here. 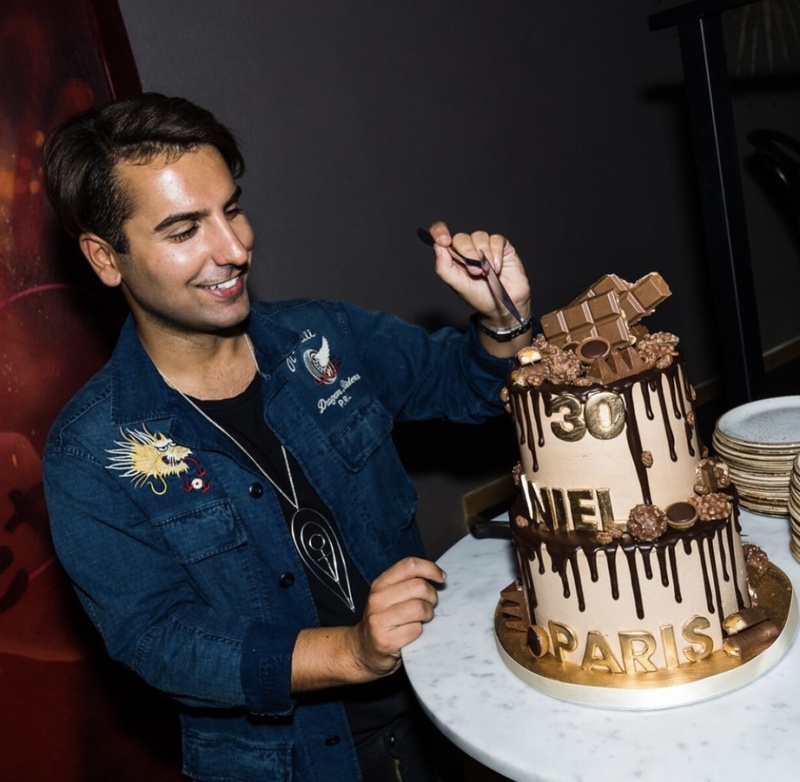 Daniel Paris celebrating his 30 years birthday in specialmade necklace. Design by : Micaela Strömvall, Handmade by : SAGA MELINA. 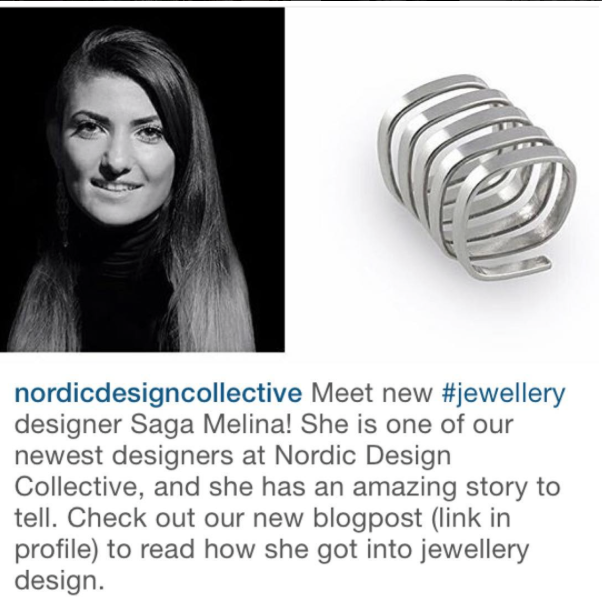 The artist Imenella in Sabina- rings. 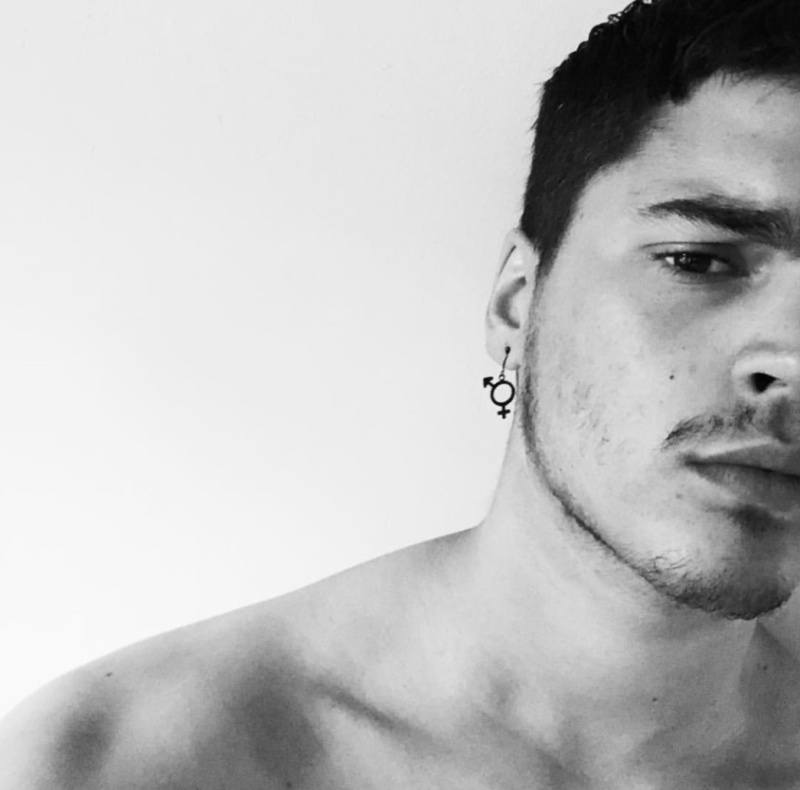 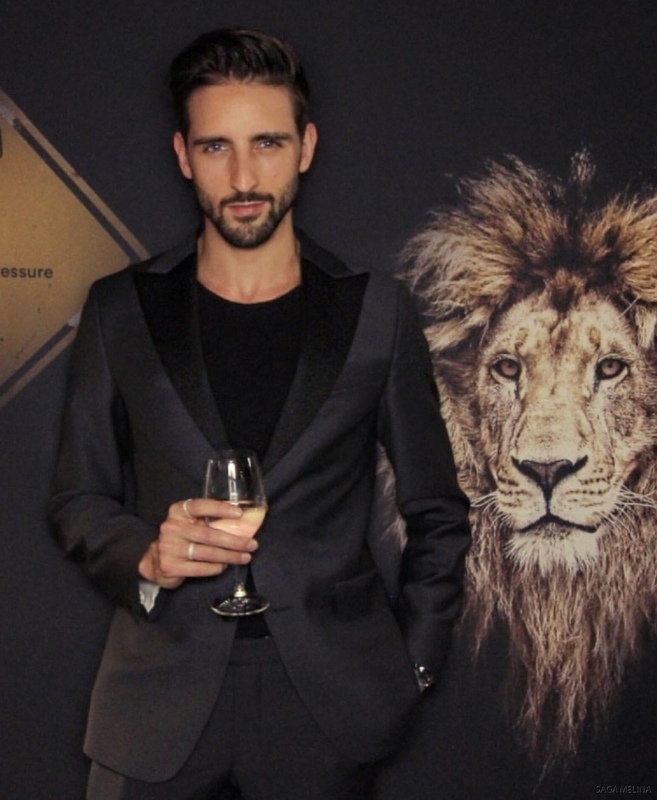 The artist Oscar Zia in customized SAGA MELINA equality - symbol silver earring. 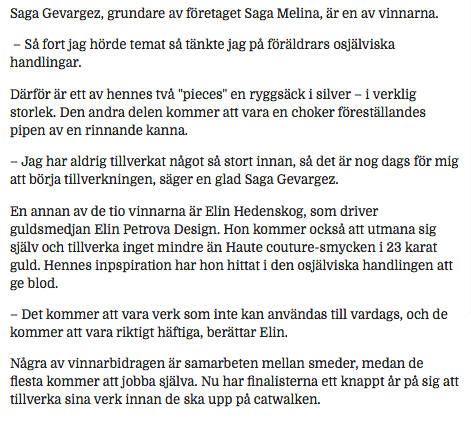 The singer Lukas Meijer in customized SAGA MELINA - silver and leather necklace. 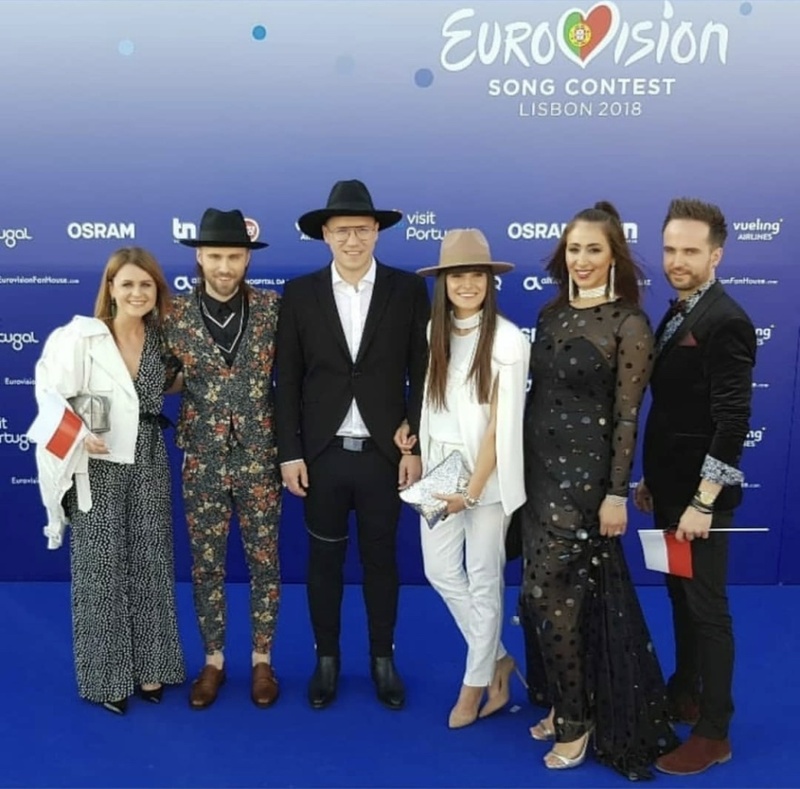 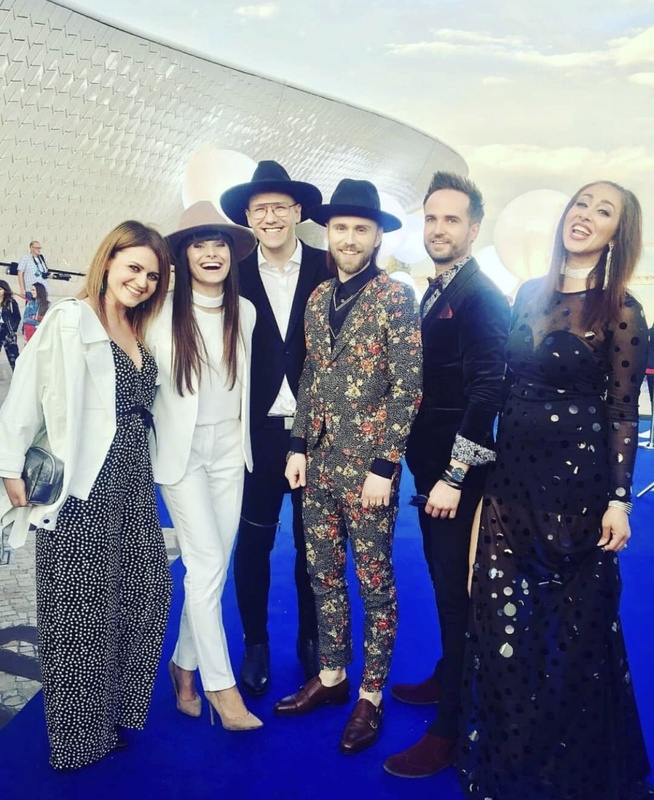 Lukas Meijer, Poland´s Eurovision 2018 contender on the blue carpet in SAGA MELINA necklaces in Lisbon, Portugal. 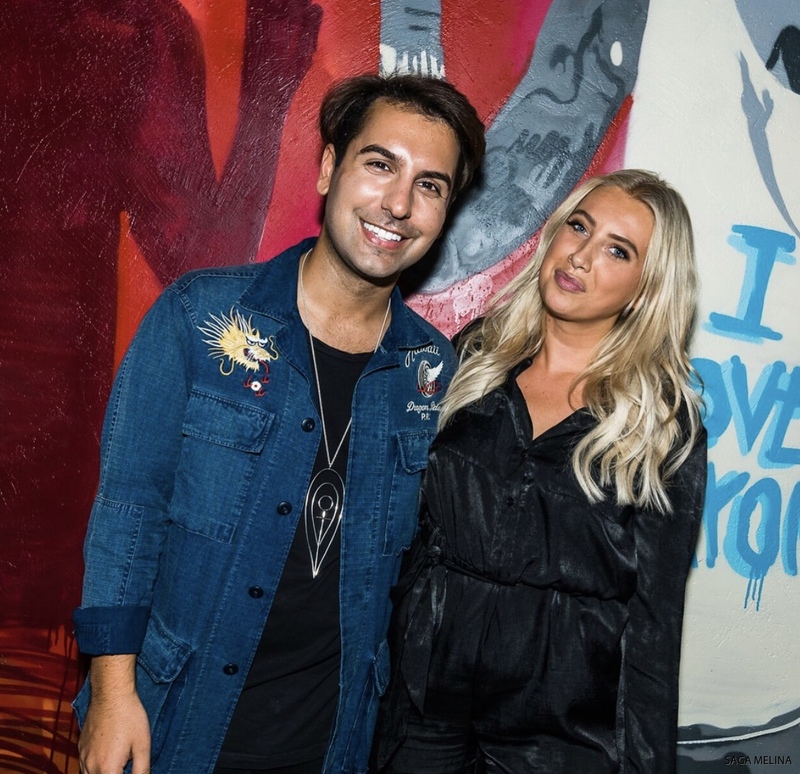 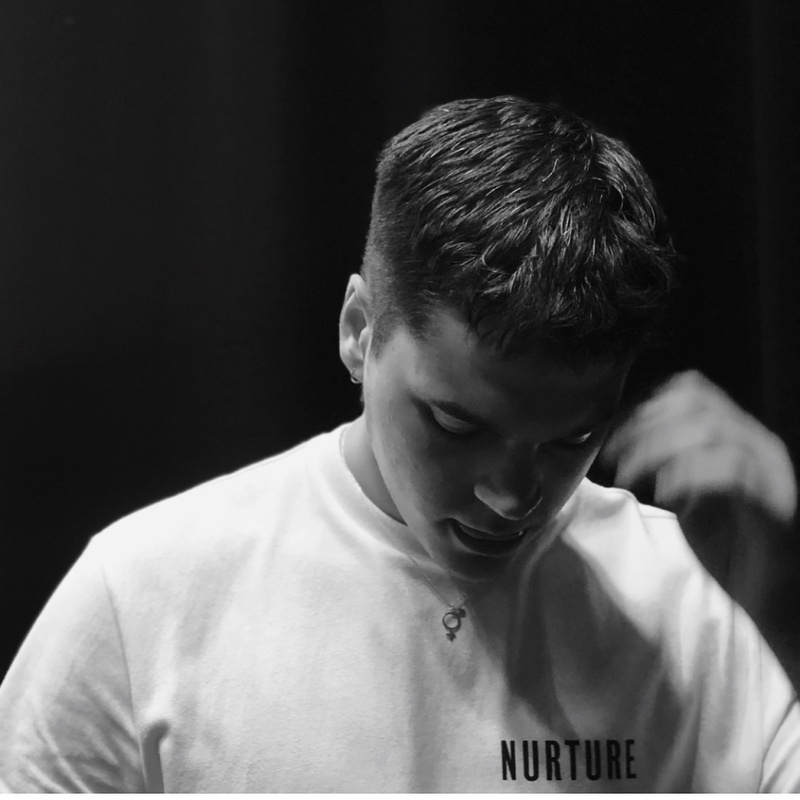 The singer Oscar Zia in customized equality-symbol necklace. 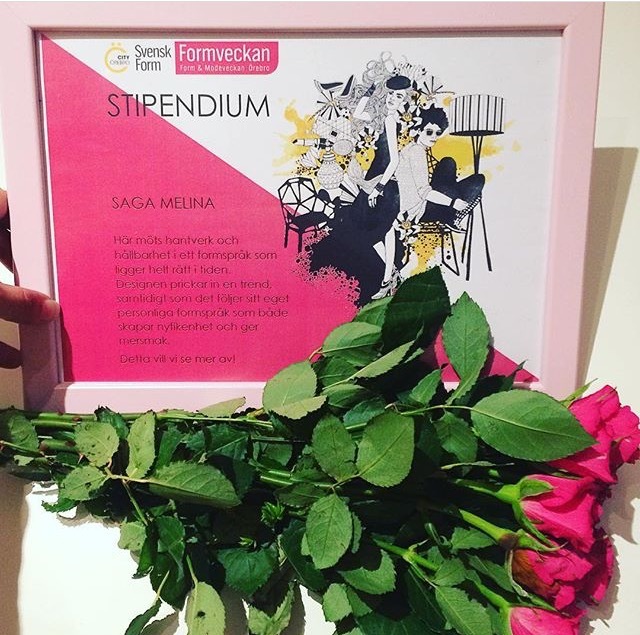 Pernilla Wahlgren in our Sabina-ring. Press photo for Kanal 5. 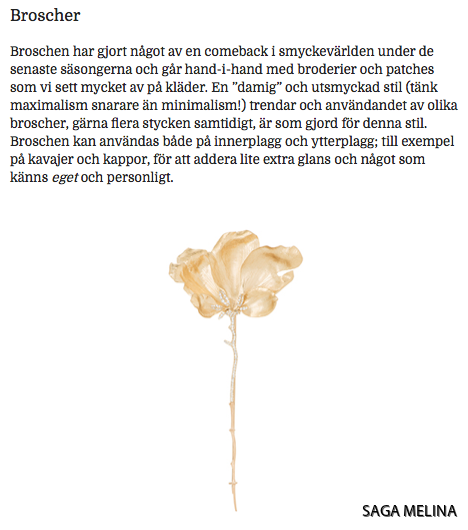 In the newspaper Aftonbladet, Sunday February 18th. 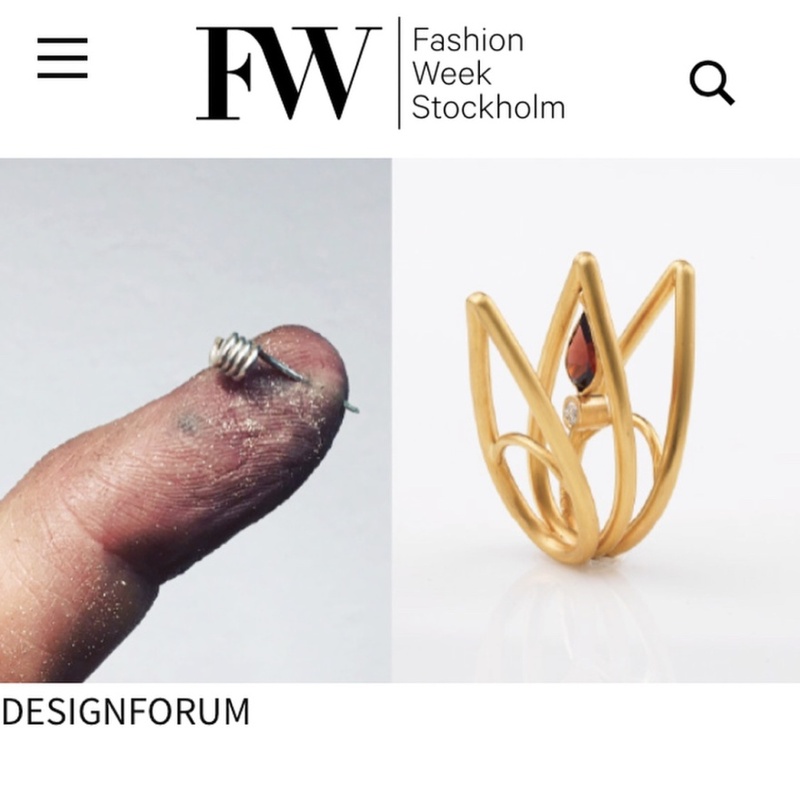 We are one of the 10 chosen jewellery designers that will show jewellery's on catwalk during Stockholm Fashion Week August 2018. 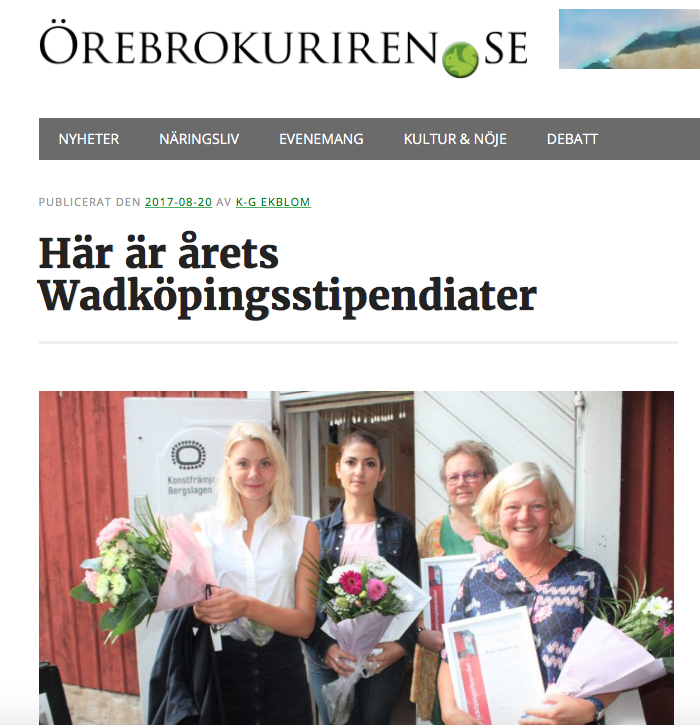 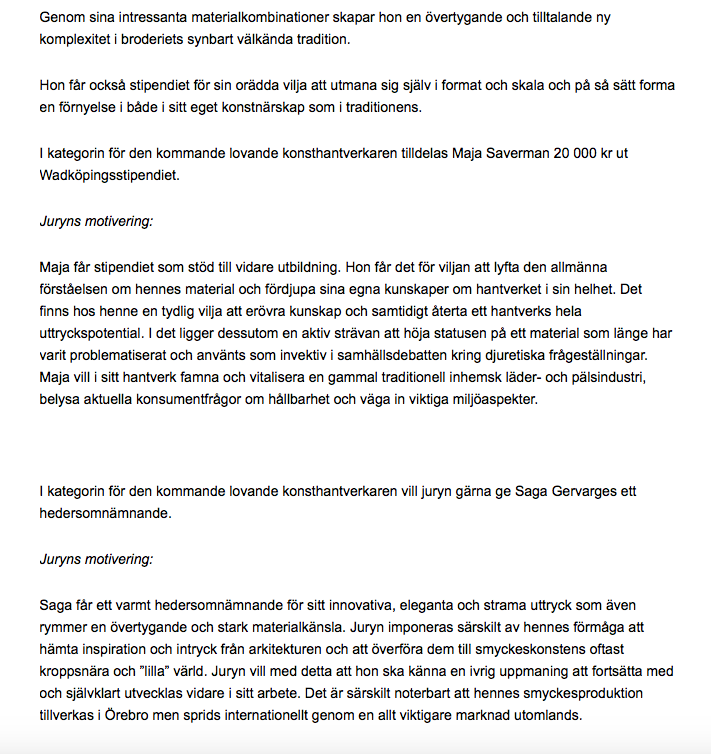 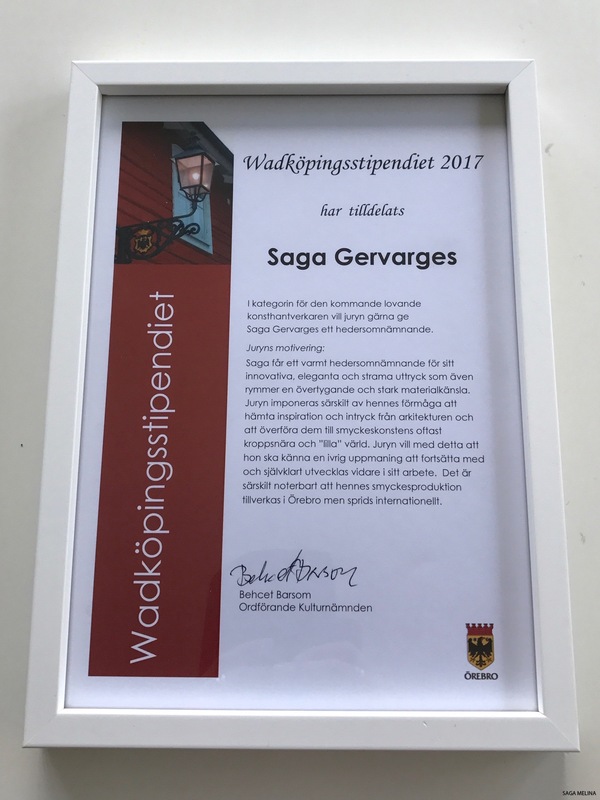 Received a honourable mention by Culture Committeein the city Örebro. 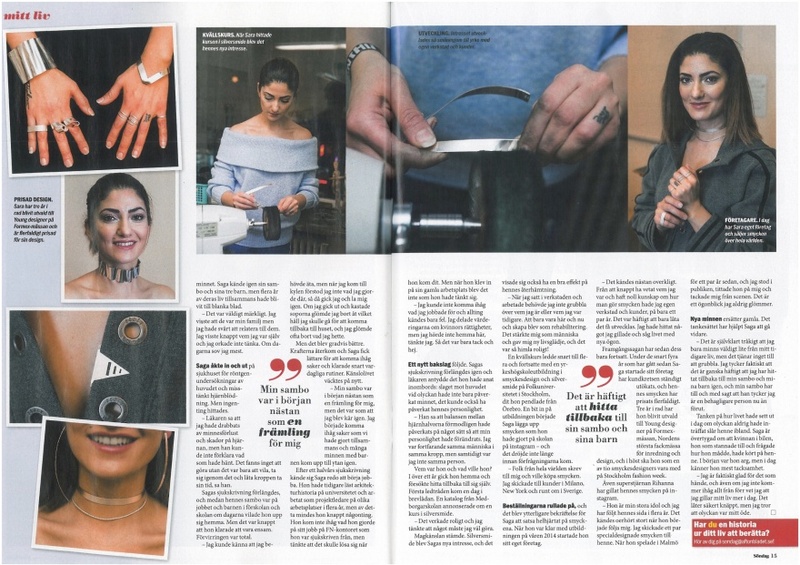 The Super Power duo Rebecca & Fiona in customized Saga Melina-jewellery. 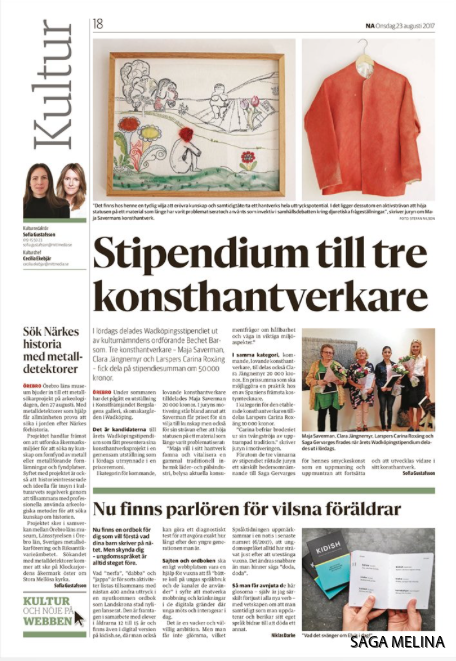 In October we had an exhibition at Örebro Läns Museum. 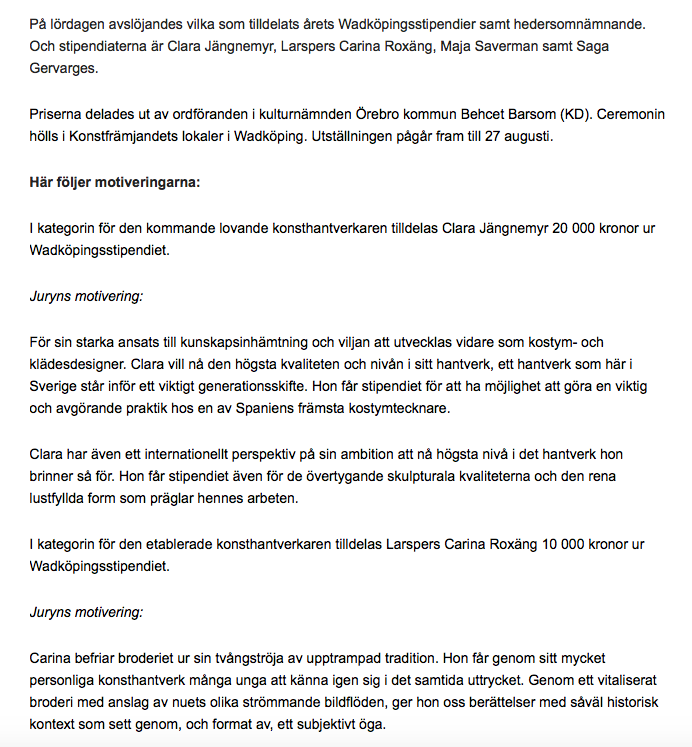 During these we got a scholarship from City Örebro and Svensk Form. 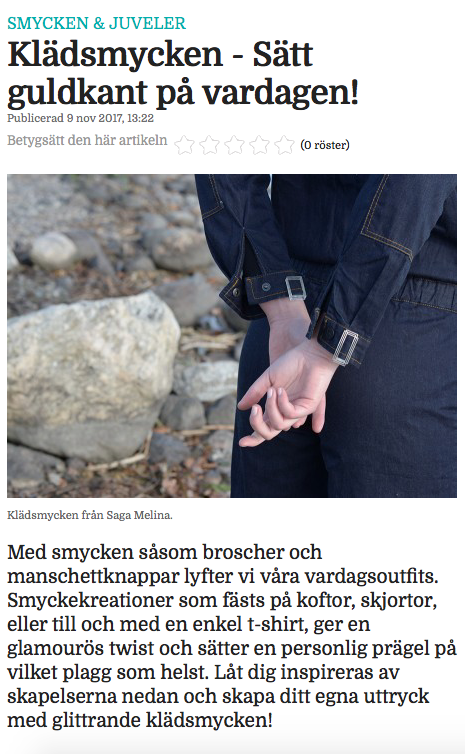 "Here meets craftsmanship and durability in a idiom that is just right in time. 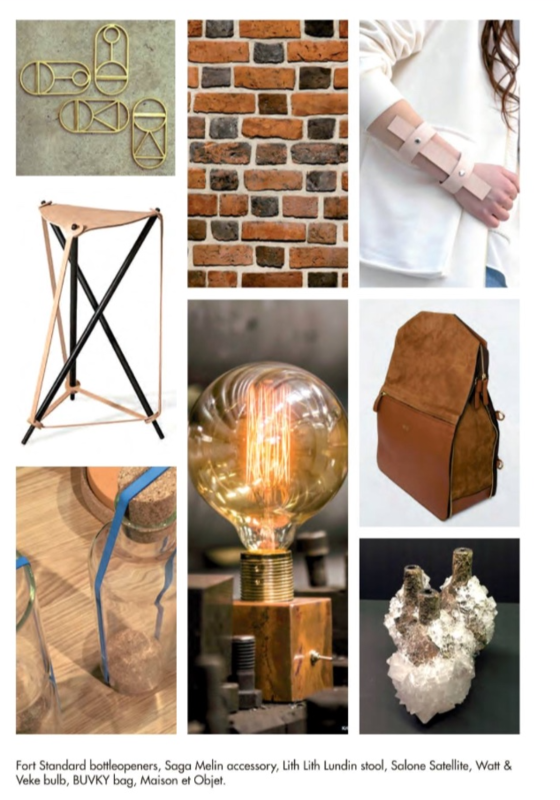 The design dots into a trend, while it follows its own personal idiom that both creates curiosity and makes you want more. 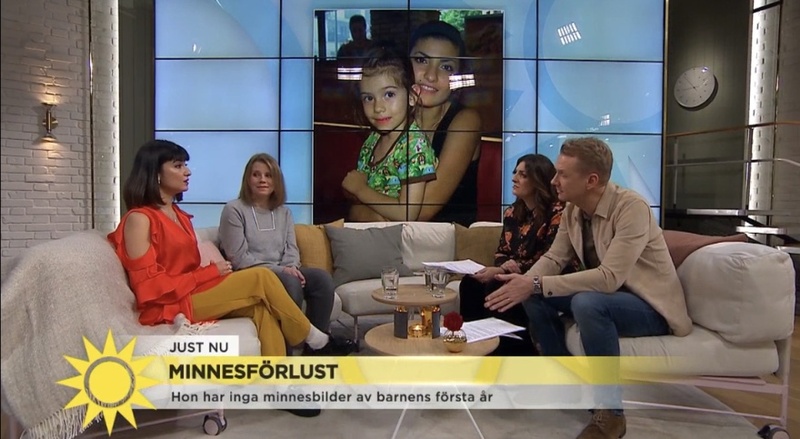 We want to see more of this!" 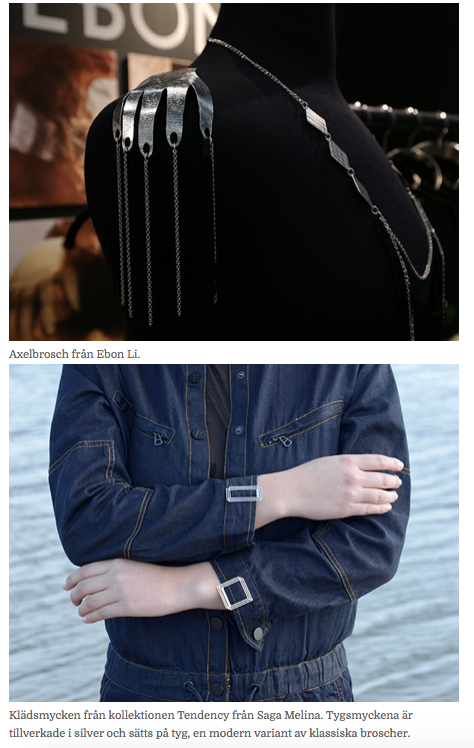 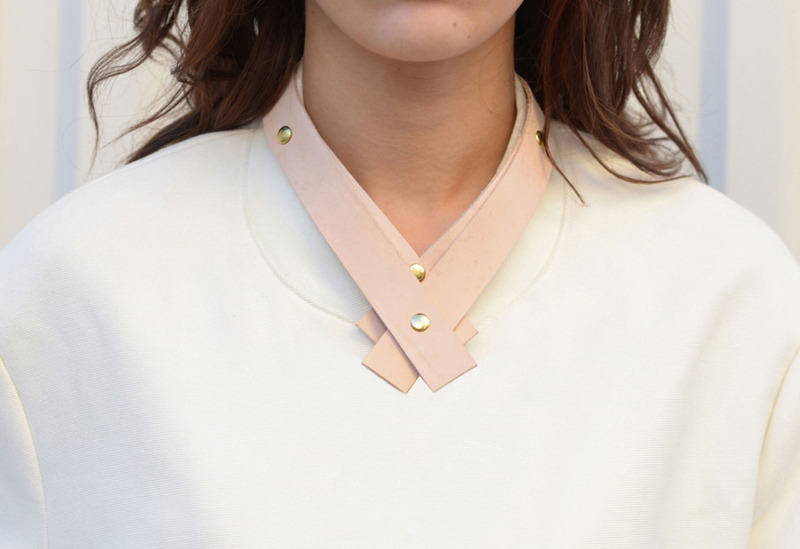 Our leather bracelet "Ribbon" chosen as the trend of the season of Swedish Fashion Council. 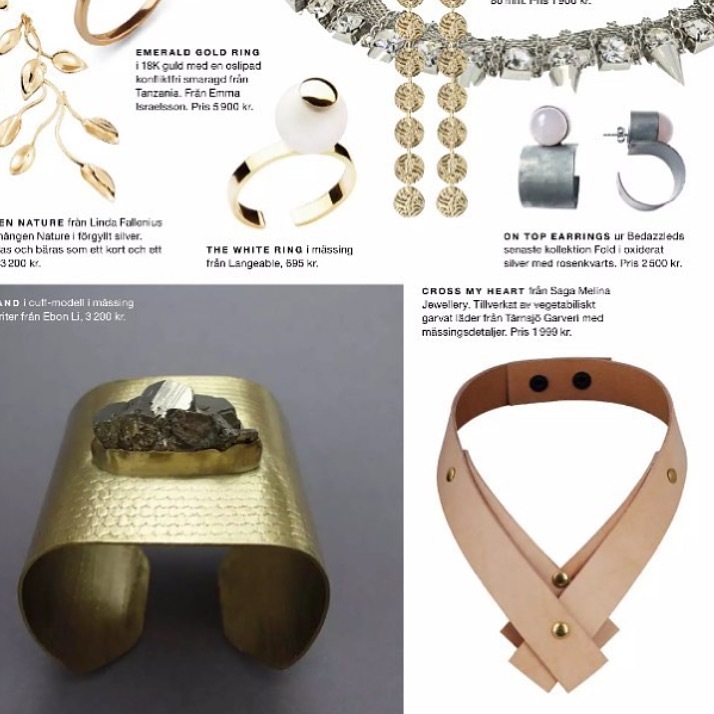 Our "Cross My Heart"-necklace in the beautiful, Lifestyle Watches & Jewelry Magazine. 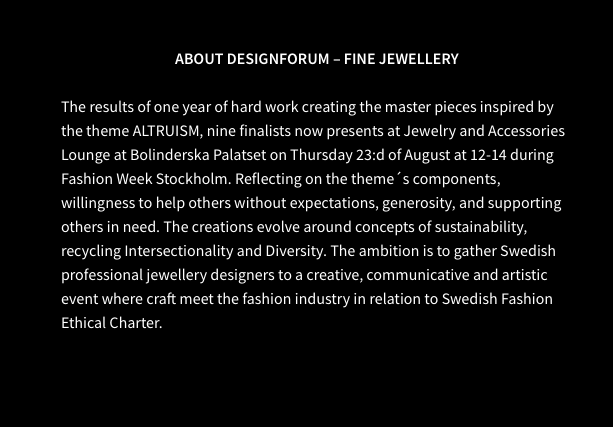 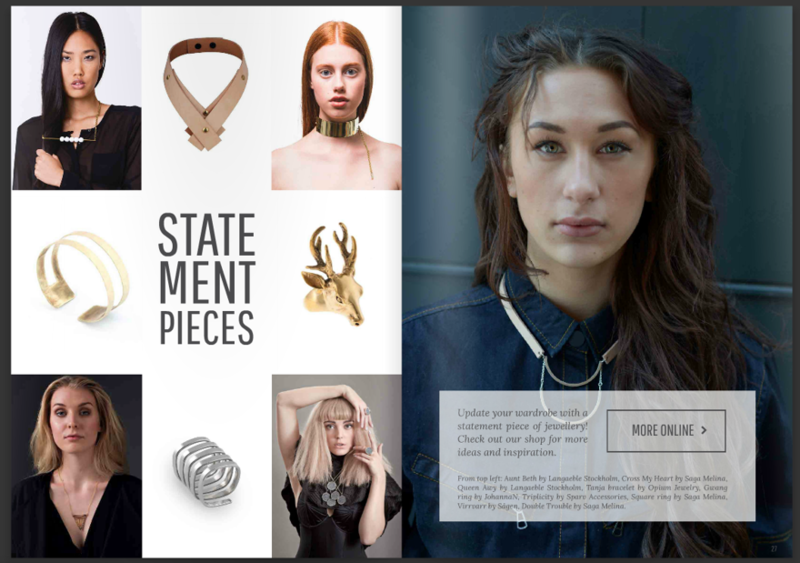 Our necklace " Cross My Heart " is nominated for Formex Formidable 2015 - This year's big event for Nordic interior design! The price Formex Formidable want to lift juried objects that combine typical of design, intrinsic quality and attract usage. 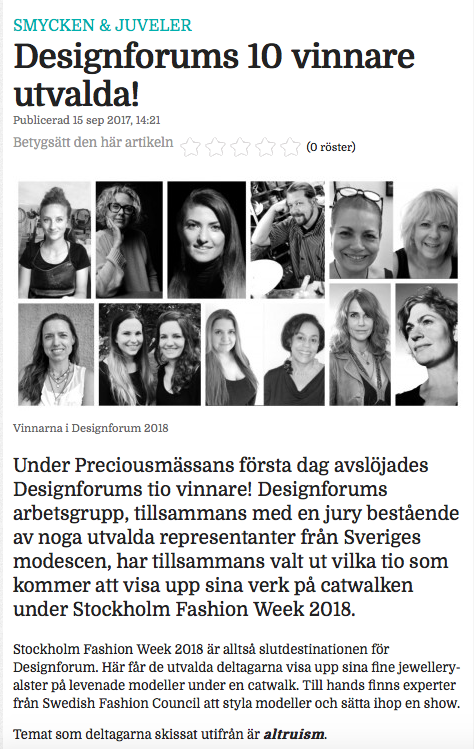 Around 20 products from producers that are involved at Formex - Scandinavia's largest interior design trade fair , is chosen and crowned two winners - both jury and special prize People's Choice . 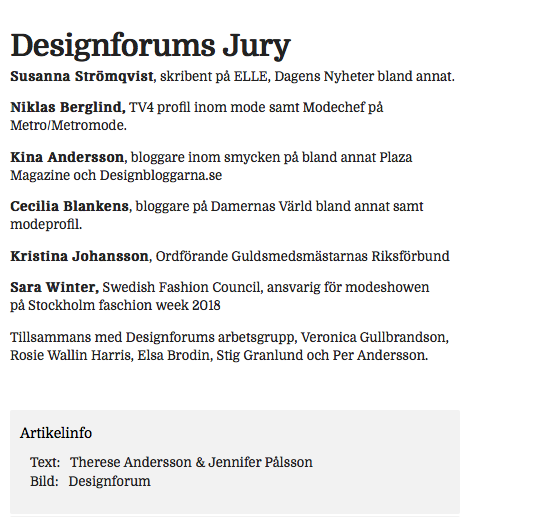 The jury consists of people with long experience and extensive knowledge in design and décor area . 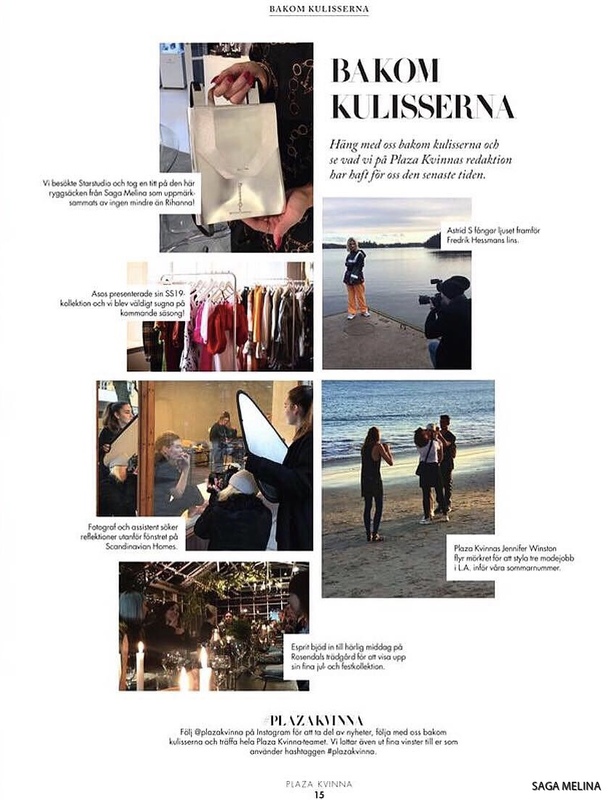 Chairman 's trend expert Stefan Nilsson . 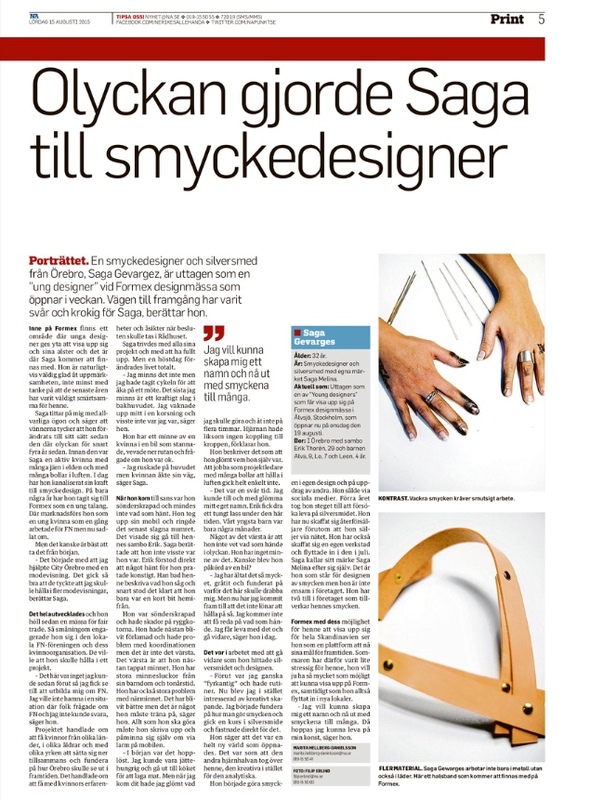 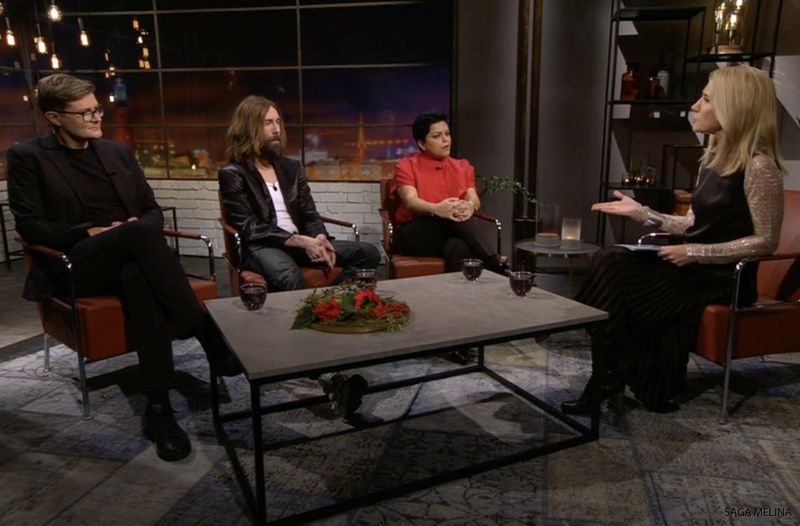 Along with Comfortable Hem Dan Gordan , architecture and design critic Annica Kvint , Kajsa Falck Torlegård from Formex and designer Alexander Lervik . 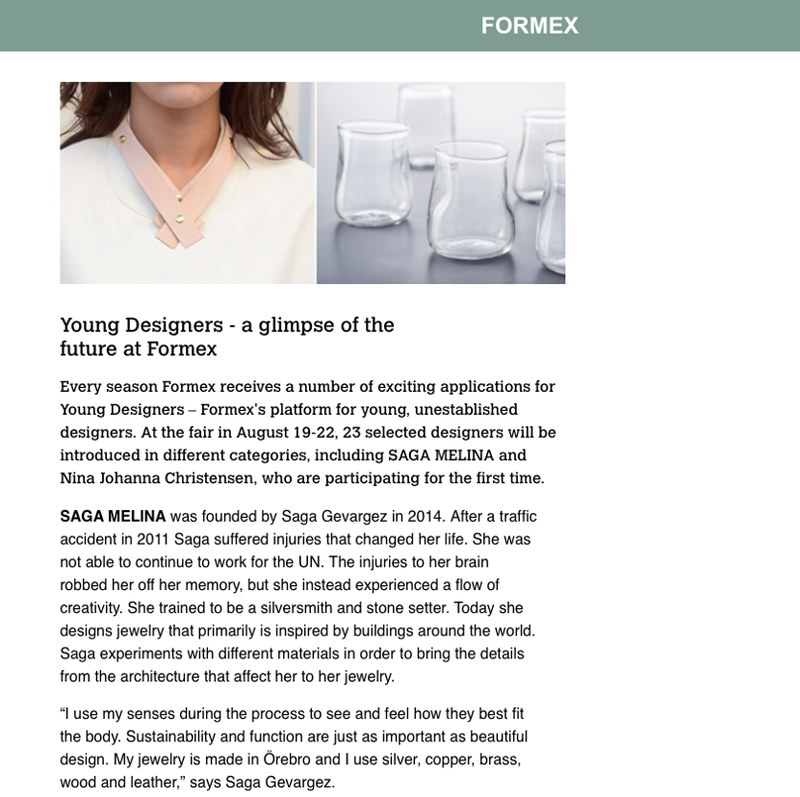 Formex press breakfast on Jan. 20, 2016 crowned the winners. 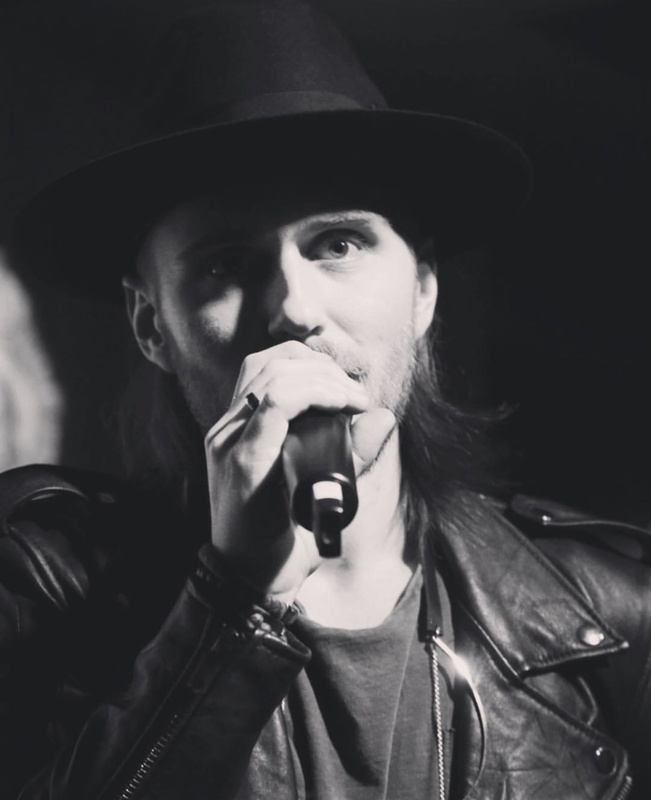 The contest "People's Choice" , you can make a difference who wins. 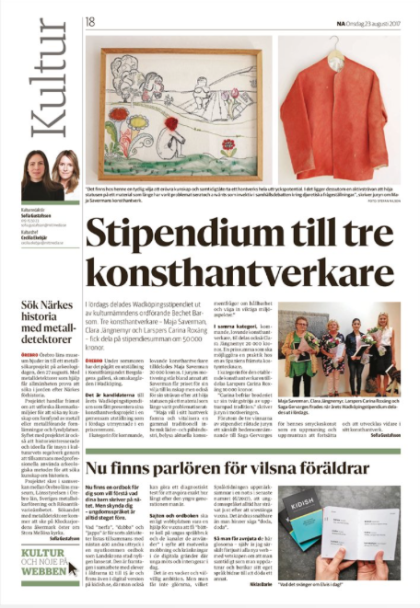 Then take part also in the draw for a great prize . 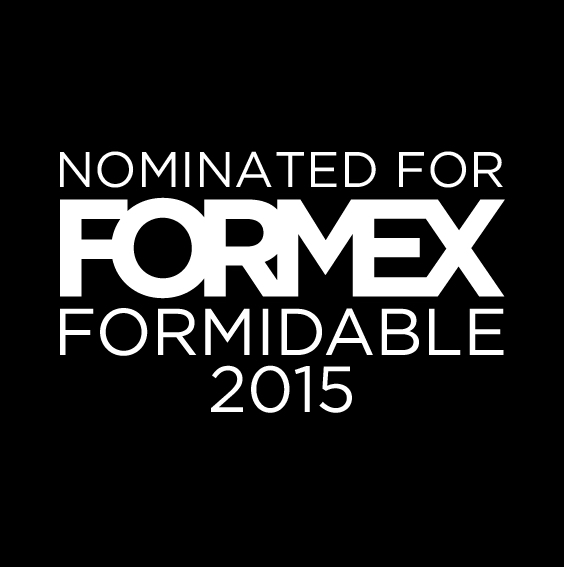 Visit www.formex.se and vote on number 10! 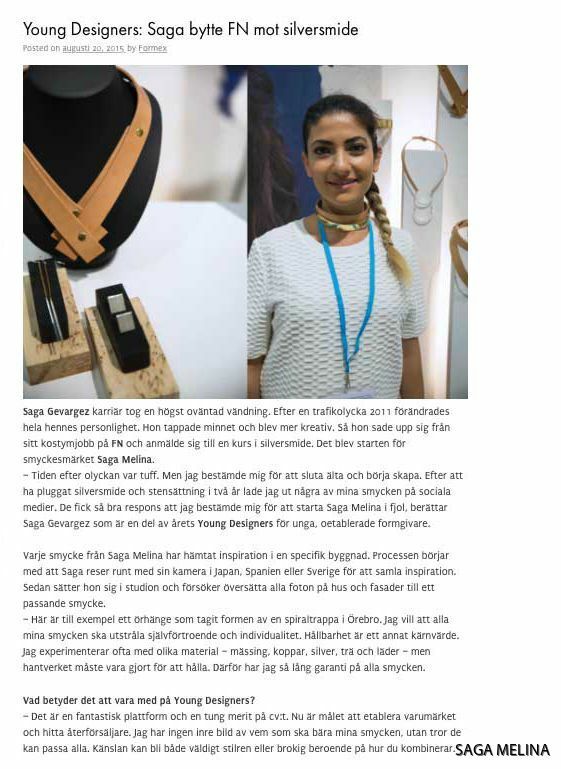 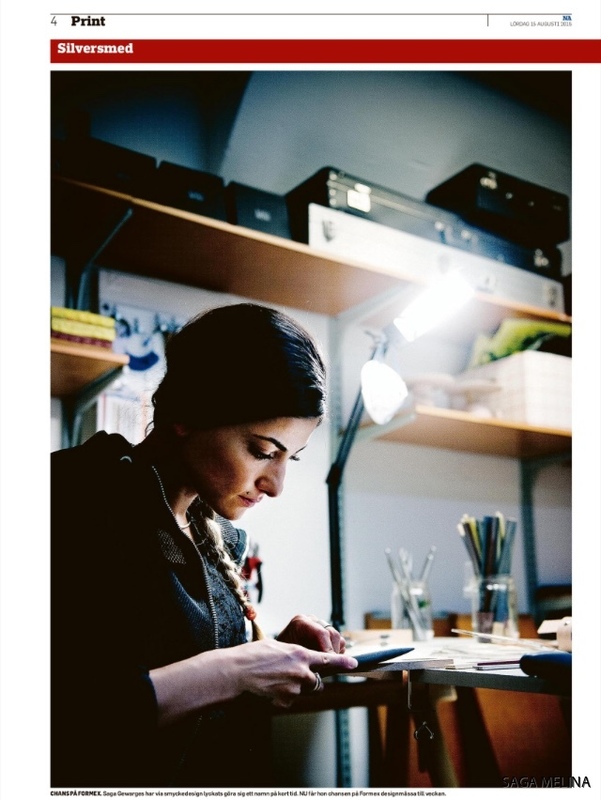 chosen as nordic exhibitor on london design fair. 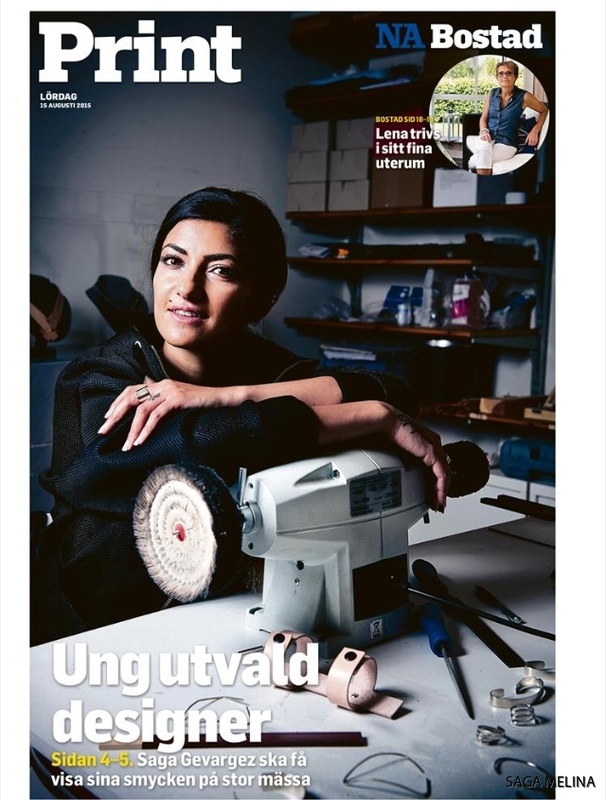 LATEST NUMBER OF "NORDIC LIVING".